Among other things that make Haleakalā special in Hawaiian tradition, this volcano is the house of the sun, a sacred place used sparingly by humans and held in reverence as a place of prayer. Haleakalā is the piko, the navel or spiritual center, of all of the islands that once were joined as Maui Nui: Maui, Moloka’i, Lāna’i, and Kaho’olawe. Today, Haleakalā attracts many other human uses, some of which come into conflict with each other. These conflicting perspectives must be resolved in order to ensure that Haleakalā will continue to be a special place for Maui residents and visitors alike. 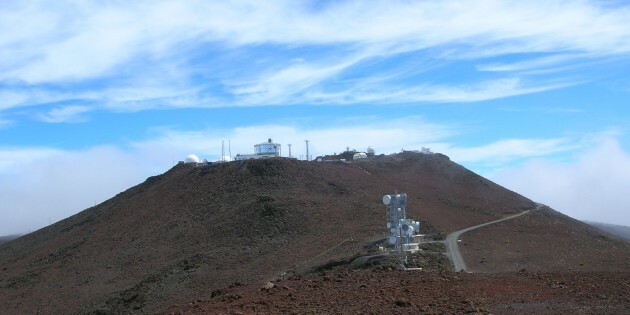 In this unit, students learn more about the scientific research that takes place within the Haleakalā Observatories complex and what makes the summit a good place for that kind of research. Then they explore different ways that people think the summit area should be used, focusing on the unresolved issue of the location of broadcast facilities on the mountain. Students explore the significance of the summit area of Haleakalā from as many perspectives as they can think of, including its traditional Hawaiian importance and its suitability as a place for observatories. Students use existing points of view to develop testimony for an in-class “public forum” on an issue about the appropriate use of the summit area. Students also articulate their own perspectives on this issue. Students perform Internet research to learn about the work being done in the observatories on Haleakalā. 1. What significance do different people place on the summit area of Haleakalā? 2. How do those perspectives influence views about how the summit area should be used? 3. What are students’ opinions about a real-life proposal concerning the use of the summit? A contemporary issue revolving around the significance and use of the summit area. People have many different perspectives about the importance of the summit area and which human uses are appropriate there. These perspectives and how they are expressed influence how the top of Haleakalā is used. • Begin the unit with an activity that gets students interested in what can be learned about the sun from earth. This is an important component of the research taking place at Haleakalā Observatories. Many activities can be found on websites in the “Resources for Reading and Research” listing below. A simple one entitled, “Finding the size of the sun and moon” can be found on the UC Berkeley, The Center for Science Education At Home Astronomy website. • Have students write “letters to the editor” based on their own views about how the summit of Haleakalā should be used. • Have students read chapter 25, “The House of the Sun,” in Born in Paradise, Armine von Tempski’s autobiography about growing up on the flanks of Haleakalā (Ox Bow Press, Woodbridge, Connecticut, 1985). This chapter describes von Tempski’s youthful adventures in the summit basin with her rancher father, Hawaiian paniolo (cowboys), her sister, and Bishop Museum archaeologists. Several scenes from this chapter offer opportunities to compare present-day views about the summit area with views, attitudes, and uses prevalent in the past. • During the in-class public forum, have students analyze the different viewpoints presented using the list of value systems included in the Activity #2 Student Page “Questions About the Viewpoints” (pp. 33-34). • Give students several days to prepare for the in-class public forum by working more in-depth with the Draft Environmental Assessment (appended to this unit), interviewing people who could shed light on the perspective they are researching, developing supporting materials or media presentations for their testimony, and so forth. • Prior to holding the in-class public forum, have students brainstorm questions they have about the proposal to move the transmitter towers. Using the table of contents of the Draft Environmental Assessment (DEA), find out whether those questions seem to be covered in the DEA. Have students gather available information from the DEA on different topics and report to the class. You could do this prior to holding the in-class public forum. • Have students research the Hawai’i and federal environmental review processes. The Hawai’i process is set forth in section 343 of the Hawai’i code. The federal process is set forth in the National Environmental Policy Act. High Altitude Observatory, a National Science Foundation laboratory, maintains educational materials related to solar research. These materials include basic sun facts, questions and answers, slides and images, suggested reading, historical material, lecture notes, and tutorials at the HAO website. A Guide to the Hawai’i State Environmental Review Process is available to download on the State Department of Health website. HRS 343, the section of the Hawai’i code that sets up the environmental review process mandating environmental assessments and environmental impact statements for specific types of proposed projects is available online here. Office of Environmental Quality Control online guide to the Hawai’i environmental review process is available here (scroll down to “Guidebook and Toolkit”). Scudder, Richard J., EIS Handbook for Hawai’i, Office of Environmental Quality Control, Honolulu. “The Environmental Notice,” a semi-monthly publication of the Hawai’i Office of Environmental Quality Control, lists current environmental assessments and environmental impact statements available for public comment. Current and previous issues are available to download here (Look for under “Quick Links”).